Developing healthy lifestyle habits can be a fun experience for the entire family! Make 60 minutes of moderate physical activity part or your family’s daily routine. Encourage your child to do at least 3 days per week of vigorous-intensity activities like biking and running, and activities that strengthen muscles and bones like jumping, shovelling snow or carrying groceries. Encourage your child to join a sports team or playgroup to take part in organized and unorganized physical activities. Check out your community centre to find out what sports and activities are offered. 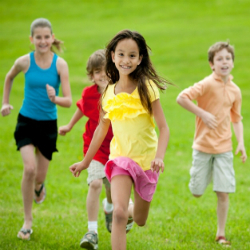 Play outdoors and enjoy public parks, bike paths and soccer/basketball/tennis courts. Walk or ride your bike to work, school, the mall, or the park. Set clear time limits for screen time (television, computer, video games, cell phones) to less than two hours per day for children older than two years of age, and no screen time for children younger than two years old. Turn off the television while eating. Keep televisions, video games, cell phones and computers out of your child’s bedroom. Limit time spent in cars and buses, extended sitting and time spent indoors. Going to bed at the same time and getting up at the same time. Sleeping every night in the same environment that is quiet, calm and dark. Computers, cell phones and other electronic devices should not be used before bedtime. Ideally, they should be turned off and should not be kept in the bedroom. Encourage and support your child as he gradually adopts healthier lifestyle habits. Offer your child many different options of physical activities and let him choose. Set reasonable goals with your child and incorporate changes slowly. You don’t have to make your desired changes all at once. Before making any major changes in your child’s eating habits or physical activity, talk with a doctor. For more helpful hints, consult our brochure . Why should physicians ask about physical activity? Every physician has a role to play in helping children and teens maintain healthy, active lives. Have a look at these short videos to find out why.